When a wealthy heiress is murdered, Poirot steps out of retirement to find the killer. As the master detective makes his way through the list of suspects, he finds the solution in an elaborately planned scheme almost impossible to believe. Agatha Christie's works will always hold a special place in my heart, because I was introduce to her by Great Grandmother. Since then I have read most of her stand alone novels and a few from her Miss Marple and Tommy and Tuppence series. However, I realized I have never read the Hercule Poirot series in order, a just a few out of order. So one of my goals for this year was to start from the beginning and read through them all. Only, I ran into a bump with the first book. The waiting list was long at the library and I could never seem to find the first book. The latter only being a problem because I have a thing for my books series matching. So it really was my own fault that. ANYWAY! I finally managed to get the version I was looking for while at a book even a few months back. Then of course other things found there way on top of my reading pile. So I figured, vacation was a good time to bust it out on my flight. Once again I was starting a book that I had high hopes for, because I do love Agatha Christie's work, but it had been a while since I cracked one of her works open. At the start I found it hard to get into the Mysterious Affair at Styles, but I think it might be because of the era that the books was set it. The book is set in the summer of 1917, just toward the end of World War One. Which is an era that I know very little about in terms of social queues and traditions. So it took me a few pages to pick up on the way people spoke to one another and such things. Once I managed to pull myself into the settings, I devoured this book during my to flights (to my family and then back home). There is a reason Agatha Christie is called The Queen of Mystery. I never found myself wanting to put down the book as the plot slowly unfolded itself around me. In fact I found myself actually afraid for characters that I had come to enjoy within the family when I thought they might be involved with the murder of Emily Ingelthrop. I even found myself trying to solve the murder before Poirot gave his famous sitting room reveal. In fact during the last few pages I thought I had it all figured out with evidence laid before me. I was excited as the trail portion of the book took place and was ready to see the culprit convicted. Then of course, I realized I was wrong because there was a couple pieces of evidence that hadn't been seen. One path that I hadn't seen that, of course, our famous detective had caught onto. It's something I'll keep in my mind when I dive into the second book. Honestly I really only had one complaint about the book and that is the character of Captain John Hastings, Poriot's sidekick. He is suppose to be the regular chap that helps Poriot and his little gray cells. Personally, he felt kind of one sided to me throughout this first book. I know his purpose was to be Poirot's eyes and hears inside the family, but I times I felt him a little too thick at times. Though he did make a wonderful narrator through the whole story. So I forgave him for not being Doctor John Watson, which was probably my problem with if I'm being completely honest. 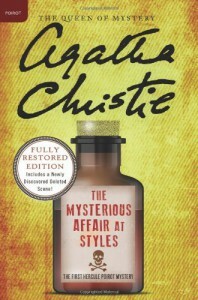 All and all it was a wonderful book and a great way to get back to reading more Agatha Christie. To the point even my flatmate has picked one of the stand alone novels to read. I've already put the second book on hold at my library and made sure that I pick up the Agatha Christie book I found my Great Grandmother's farm at the top of the pile. For those that have never read any of this women's book I strongly suggest picking one up. Especially those who love a good murder mystery. She's one of my favorites!